Available for Fall 2014 classes, this update version features new content from Kathleen Berger in response to the release of the DSM-5. This new content is integrated into the text without changing pagination or the structure of the chapters. A special DSM 5 Supplement by Berger is available for Fall 2013 and Spring and Summer 2014 courses. 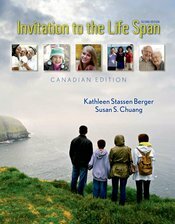 View the Page-Referenced Guide to the DSM-5 updates for Invitation to the Life Span.